Online before it hits physical print in the Sunday NYTimes Magazine this weekend: "What He's Been Pedaling," a profile of Floyd Landis and his effort to overcome a debilitating hip condition to win the Tour de France. Landis has avascular necrosis, the same condition that felled Bo Jackson, and a few weeks after the Tour de France he'll be having his hip replaced. It's interesting that Landis and his team have chosen to reveal this condition in the middle of the Tour. He doesn't seem to be the type to need a built-in excuse for failure, and no one in the Tour will take pity on him. Perhaps he just tried to break the news before it emerged in the NYTimes? But he was the one who revealed the info to the interviewer, so it's not as if this dropped out of the sky. After Landis has hip replacement, he may be able to ride at the same level, but he may not. There's no precedent to refer to, and so I'm rooting for him to get on the podium this year. It might be his last chance, though I hope it's not. 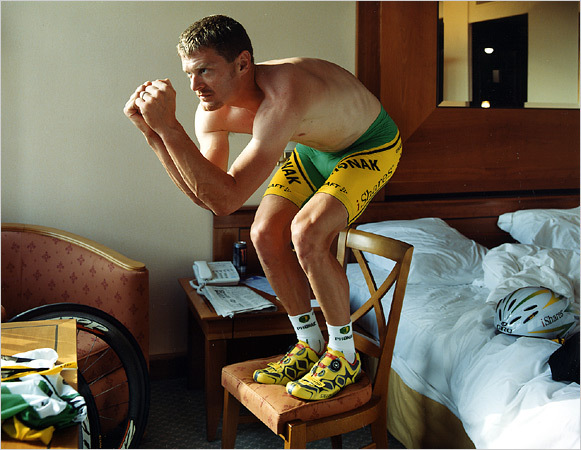 Here, Floyd Landis demonstrates his time trial position, which he calls the Praying Mantis. toilet in a narrow stall: 'Please bring toilet paper to stall number 3 right now! Godspeed.'"